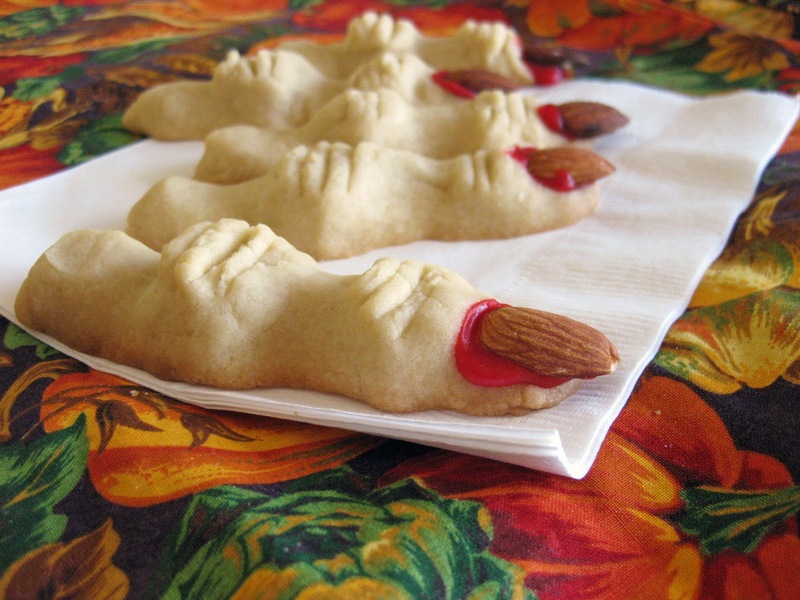 Whether you call them witches' fingers, monsters' fingers, ladies' fingers or ogres' fingers, these Halloween cookies are a winning combination of gross looks and great tastes. I served them at a Halloween bash, and while a few people were squeamish about eating them, I consider that an indication of a successful Halloween dessert! I didn't know about these great cookies of my own accord. My cousin made some a few years ago and told me that I had to make them. I'm glad I finally did . . . they were a huge hit! In fact, with Thanksgiving right around the corner, I'm thinking these might even look great along with the traditional spread. I can imagine four fingers and a thumb sticking out of a pumpkin pie, ready to grab the first person to take a slice! 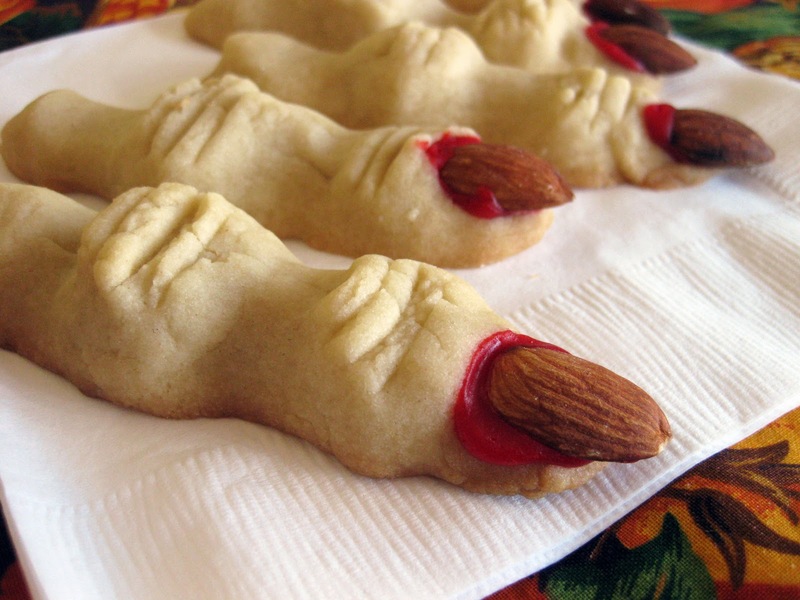 I didn't shop around much for my creepy finger cookie recipe. There are quite a few on the internet, and I tried one of the first that I happened upon. It was pretty delicious: a sandy, shortbread-like cookie that was flavorful. I tried an eggless version out of curiosity, but I've posted in parentheses how to incorporate an egg since I know that egg replacer is not a standard pantry item in most homes. Another thing I love about this recipe is that it's easy to tweak the various cookie aspects to make a uniquely monstrous dessert. 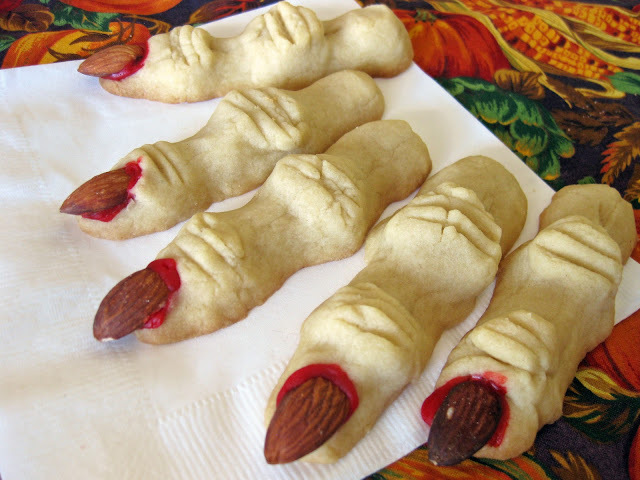 You can try adding some food coloring to make creepier cookies, like green Frankenstein fingers. Or, try switching out the almond for a shelled pistachio if you want an uglier, mangled nail. You can even replace the red frosting for green, purple, or black icing if you want a "monster blood" look. I even made some zombie fingers when I accidentally broke a few fingers while they were still hot and then glued them back together with red icing. They were so cool that I went on to make some more on purpose. In a mixing bowl, beat together butter, sugar, EnerG egg replacer/water mix, and extracts. Beat in the flour, baking powder and salt. Cover and refrigerate for 30 minutes. Break off small lumps of dough and roll each one into a cylinder. Gently pinch the dough cylinders to create thin bone areas and first and second knuckle areas. Use a butter knife to make the knuckle patterns. Press an almond firmly into the end of each finger cookie. An important note is that the dough expands while baking. 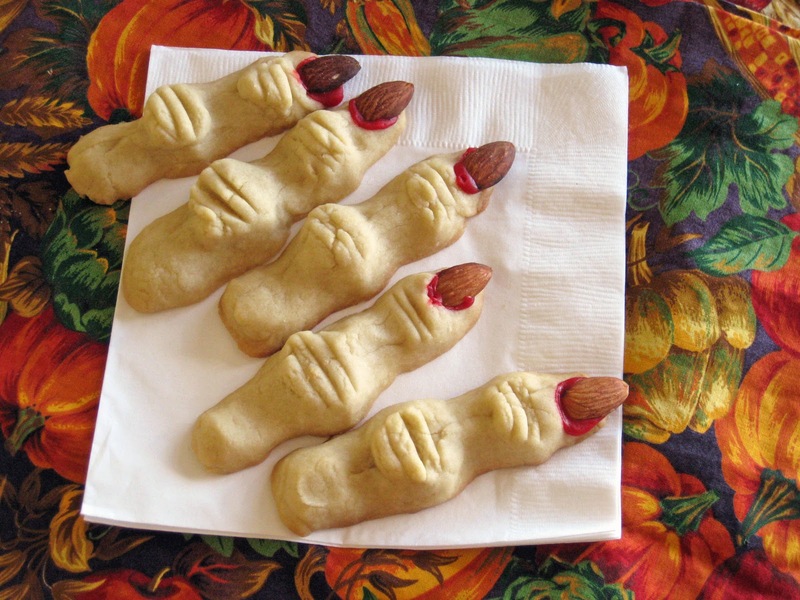 If realistic witch fingers are important to you, try making a few test fingers before baking the whole batch. Place cookies on a baking sheet lined with parchment paper and bake for 20-25 minutes, or until they begin to brown on the bottom. Let cool for just a few minutes before lifting the almonds, squeezing red decorating gel/frosting underneath them, and pressing them back down. Also, I froze half of the dough and found that it had no negative effect when I later thawed it, formed more fingers, and baked them.